Hi all, welcome back to another Dark Hunter novel. This week’s “Time Untime” is a little different to the previous ones. Or at least that’s how it felt to me. This time it seemed that the human (Dr Kateri) was the one targeted and Ren just happened upon her at the right time therefore making this a Dark Hunter novel. 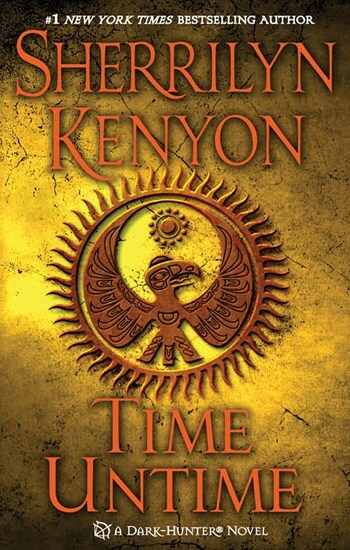 To give you a big of background knowledge, we met Ren with Sundown a few books ago and in that one he was the quiet, yet knowledgeable one that seemed to always find a way to survive… So to then have him as the centre focus of this book and turns out he’s trying to kidnap Dr Kateri is really bloody weird. To my knowledge no Dark Hunter has kidnapped a woman before. So what the hell is going on?! Dr Kateri on the other hand is being plagued by nightmares that feature Ren. Her grandmother seems to think Ren is a good guy, but then why does he freak her out so much? And when she meets him in real life why is he trying to kidnap her? And given that the focus for this series has been on ancient Greece, Rome, the Celts and Amazons with the occasional deviation. This one felt way off the beaten track and I didn’t know where we were going. Right up until the end of the book when Ren’s existence is explained I was completely confused and didn’t know what to think or who to trust. Like he seemed like a nice guy in Sundown’s book but the Ren in this book was completely different! Purely because it is so different to the other’s I’m not a massive fan of the story as part of the series. However as a stand alone book this is really well written. It has adventure, suspense, some romance and good old fashioned betrayal. So it’s a good read, just not one of my favs in the series. And that’s a wrap for another week. I look forward to sharing my all time favourite with you next week! We're back to the Native American history which is relatively new to the series and seem to get a few more questions raised, then answered. Click, read, like, comment and share!